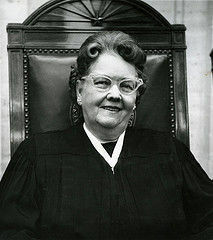 Lorna Lockwood, who was born in Douglas, became the first female justice of the Arizona Supreme Court in 1960. As the woman headed into the court building, she was stopped by a security guard who informed her she had to move her car, as that parking spot was reserved for Arizona Supreme Court justices only. “It took some doing,” laughed Lorna Lockwood, “but I finally persuaded him that I was entitled to it, even if I was a woman.” In 1961, at the age of 58, Lorna climbed the steps of the courthouse as the first woman to sit on the bench of the Arizona Supreme Court. Lorna Elizabeth Lockwood was born in Douglas on March 24, 1903. The family moved to Tombstone in 1913 when her attorney father, Alfred C. Lockwood, was appointed Superior Court judge for Cochise County. Lorna graduated from Tombstone High School in 1920 but only after obeying her father and spending a year at home learning the domestic arts. She graduated from the University of Arizona in 1923 and set her sights on a law degree. “My entrance into law school at U of A was much against the wishes of the dean,” Lorna said, “who tried (without success) to talk me out of it.” She received her law degree in 1925. Lorna discovered no one would hire a woman lawyer and the only jobs available were as legal secretary or law clerk. With her father now sitting on the bench of the Arizona Supreme Court, she worked as his secretary until 1939 when she and attorney Loretta Savage opened their law firm. People were still hesitant to hire women attorneys, however, and the partnership dissolved after a few years. During this time, Lorna won a seat in the Arizona House of Representatives as a Democratic representative from Maricopa County. Active on the child welfare committee as well as in public health and education, her legal background provided her the opportunity to serve as vice-chair of the House Judiciary Committee. Re-elected in 1941, she presided over the judiciary committee. At the beginning of World War II, Lorna resigned her position and headed to Washington, D.C., to work as secretary to Arizona’s lone member of the U.S. House of Representatives, John R. Murdock. After the war, she joined her father in private practice. Entering politics again in 1947, Lorna won her third term in the Arizona House. She left the Legislature in 1949 to accept the position of assistant attorney general. In 1950, she sought a seat on the Superior Court representing Maricopa County. One of 13 lawyers running for five seats on the court, she told her audiences to vote for the first candidate of their choice and for their second, third and fourth selections. “All I ask is that you cast your fifth vote for me and give a woman a chance to prove herself on the bench in Arizona.” On election day, she garnered enough votes to land the fifth position on the bench, the first woman elected to Arizona’s Superior Court. Quickly earning the reputation as a tough but fair judge, she brooked no nonsense in her courtroom from attorneys who thought a woman judge was easy prey. Antics from over exuberant litigators frequently resulted in a fine and a stern lecture. In 1954, she presided over the juvenile division of the court, making needed improvements in the treatment of children in the legal system. Her work with children extended beyond the courtroom as she was instrumental in founding the state’s Big Sisters and Big Brothers organizations as well as the Girls’ Ranch of Arizona. In 1960, she was elected the first woman to serve on the Arizona Supreme Court. She moved into the office once occupied by her father and resurrected his well-used desk, the one he had sat behind for 18 years, most of those as Arizona’s chief justice. In 1965 and again in 1970, she was selected as Arizona’s chief justice, the first woman in the country to attain the highest state judicial position. When vacancies on the U.S. Supreme Court occurred in 1965 and 1967, Arizona Sen. Carl Hayden put her name before President Lyndon B. Johnson as a possible candidate. Johnson, however, was not convinced the country was ready to accept a woman on the U.S. Supreme Court. She retired from the bench in 1975 and died Sept. 23, 1977. After her death, a group of women lawyers instituted the Lorna Lockwood Traveling Trophy, a svelte blonde Barbie doll dressed in a black robe with a plaque attached listing the names of Phoenix women who had ascended to the judiciary. It was agreed that when the first Arizona woman was appointed to the U.S. Supreme Court, the trophy would be retired. In 1981, Justice Sandra Day O’Connor took the bench on the U.S. Supreme Court and acquired the trophy. Chanin, Abe with Mildred Chanin. This Land These Voices: A Different View of Arizona History in the Words of Those Who Lived It. Flagstaff, Arizona: Northland Press, 1977. Echeveste, Colleen. “Lorna Elizabeth Lockwood: In Pursuit of the 1967 U.S. Supreme Court Nomination.” Women in the Legal Profession. January 24, 2003. Accessed at calendar.google.com/calendar/render?tab=mc#main_7. Jacobs, Thomas A. and Nancy L. Matter. “Justice was a Lady: A Biography of the Public Life of Lorna E. Lockwood.” Copyright 1985 by Thomas A. Jacobs. Osselaer, Heidi J. Winning their Place: Arizona Women in Politics 1883-1950. Tucson: University of Arizona Press, 2009. Solano, Angele C. “Lorna Lockwood: Lawyer, Legislator, Leader.” April 20, 2001. Accessed at www.law.stanford.edu/library/womenslegalhistory/papers/LockwoodL_Solano01.pdf. She photographed the Tucson Rodeo every year from 1963 until 2011.